In the early twentieth century, two fantasy writers became friends. Their names were J.R.R. Tolkien and Naomi Mitchison; they both wrote incredible novels; but one author is still celebrated and the other forgotten. Until now. 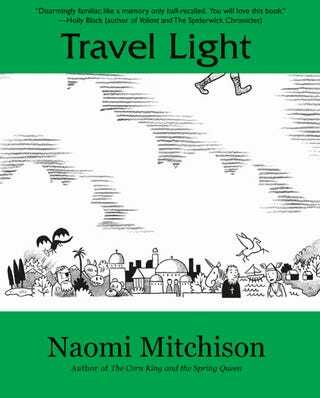 Fantasy writer Amal El-Mohtar has a terrific article about one of Naomi Mitchison's masterworks, Travel Light, on NPR this week. Though most of her books are out of print now, Mitchison had a vibrant career in which she wrote dozens of works, some bestsellers, ranging from science fiction to history. She lived to be 101, and watched the entire twentieth century unfold, embracing the idea of space travel, female sexual liberation, and the importance of Middle Eastern cultures in the modern world. Her novel Travel Light, published in 1952, is one of her best known, along with The Corn King and the Spring Queen (1931). Travel Light is the story of Halla, a girl born to a king but cast out onto the hills to die. She lives among bears; she lives among dragons. But the time of dragons is passing, and Odin All-Father offers Halla a choice: Will she stay dragonish and hoard wealth and possessions, or will she travel light? That Mitchison's life and works should have been so unfairly relegated to secret history drove home my feeling of books as points of divergence to alternate timelines; that having read The Hobbit rather than Travel Light at that fragile, formative moment of being a child in Lebanon standing at a crossroads of languages, religions and literary traditions nudged me into a different life. Who might I have been if I had met Halla Bearsbairn before Bilbo Baggins? How different might my attitude toward dragons have been if I'd met Uggi before Smaug? How different would the spiritual landscapes of fantasy and science fiction be if they had accepted as antecedents works that showed a corrupt Byzantine Christianity and sympathy toward Islam? But, most crucially for me, I wonder: Where might I have gone if, instead of a middle-aged Hobbit enamored of his pantry, I had embraced a girl who lost three homes before choosing the open road?